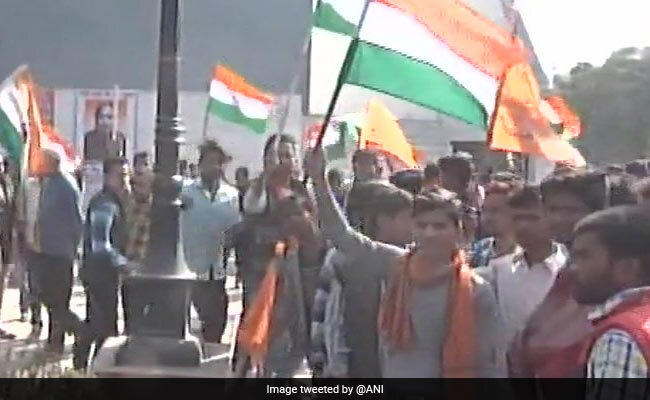 Kasganj Violence: At Agra's Tiranga Rally, Vishwa Hindu Parishad Says Message To "Traitors"
At Agra's Tiranga Rally, Vishwa Hindu Parishad Says Message To "Traitors"
LUCKNOW: As the administration struggles to hold peace and soothe tempers in Kasganj, more than a 100 Vishwa Hindu Parishad activists attempted to take out another "Tiranga yatra" 100 km away in Agra. The police initially tried to dissuade them because they did not want to take a risk after a similar rally last week shattered the peace in Kasganj. In the communal clashes that followed, a 22-year-old college student Chandan Gupta was killed. Like the bike rally in Kasganj, local VHP leaders conceded the march in Agra did not have police permission either. "We are not slaves.... we are independent," Sunil of the local VHP unit said as they tried to persuade the police to let them go. It is a point that the city's other VHP leaders also insist. "If people need to take permission for the Tiranga Yatra, how will this country run," said Deepak Agarwal, also of the VHP. Sunil said today's rally was to send a message to the "traitors" who killed Chandan Gupta. "It is a warning to the traitors... We are ready to lay down our lives and face the bullets," Sunil said at the town's Shaheed Samarak, built to mark the memories of unknown soldiers of India. Anand Kumar, Uttar Pradesh's senior police officer told NDTV that it was for officials of the districts concerned to take necessary steps to ensure the atmosphere is not vitiated. "All I have to say is that the Tiranga is a national symbol and should not evoke any controversy. That is my take on this," Mr Kumar said. The police officer said the district administration would leave no stone unturned to ensure that "if a Tiranga yatra is permitted, there will be no disruption of peace"
Violence had erupted in Kasganj on Friday after a "Tiranga Yatra" taken out by activists of the VHP and the Akhil Bharatiya Vidyarthi Parishad (ABVP) to mark Republic Day. The clashes started after an argument between two groups when the "Tiranga Yatra" was passing through a Muslim-dominated neighbourhood. Initially, the groups threw stones at each other. At some point, gunshots were also fired. The clashes were initially pitched as an attack on a rally of young men holding the National flag, a narrative that senior BJP leaders such as Vinay Katiyar and Niranjan Jyoti have also advanced. Mr Katiyar had yesterday blamed "pro-Pakistan" people living in Kasganj for the violence while Union Minister Niranjan Jyoti had called them "anti-nationals".